This was picked for an evening of chat with a friend from work, the thought being that a mix of shared tapas would be a great thing to have with a glass or two of wine. The first thing to notice on approaching the Opera Tavern were the protesters outside the door. They were objecting the presence of fois gras on the menu, something I failed to notice at all but on later review they serve do serve pork and fois gras burger as part of their bar menu. In this case, we were eating in the main dining room upstairs and not sure it was on our menu. I failed to notice something else as well, walking in and managing to knock the booking computer off its little shelf. Luckily it survived, enabling us to be easily checked in and led to table. 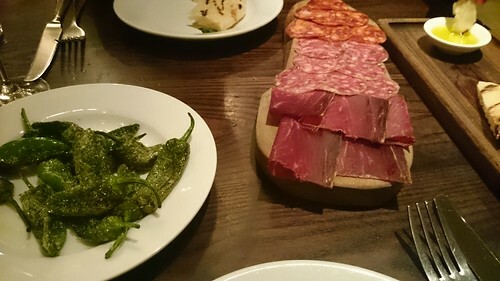 We started off with a plate of padron peppers and another of mixed charcuterie. The peppers where well grilled with just the right amount of salt; the meat had a good mix of sausages and ham. We were also served with great bread and brilliant peppery olive oil. 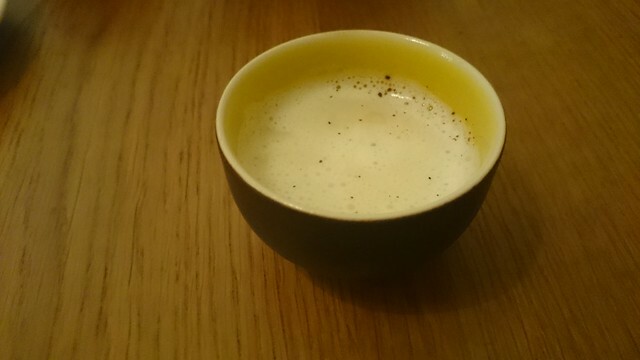 I’m not very good at taking photos when dining with someone, so that is the only one from the evening. But we ate more, lots more! 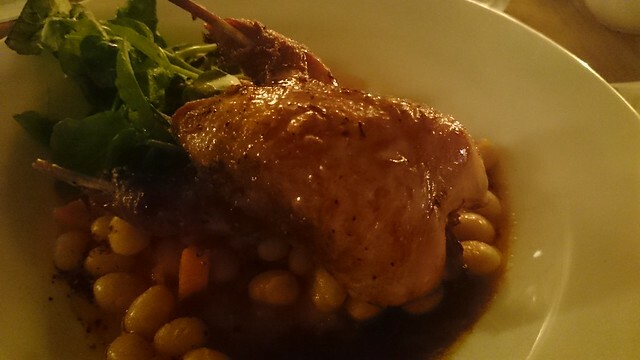 We had the confit of pork belly with rosemary and canelloni beans. The pork was very moreish, especially the thin crispy slice of crackling and the beans made a pleasant contrast with the hint of heb coming through. The lamb was good, so were the cod croquettes. My favourite was the grilled prawns, served with garlic, something that is so hard to get just right and these were served just right – nearly as good as the ones I had in Spain a few weeks ago. We had a great night, with good wine and the food cooked well. It still suffered from one of the downfalls of tapas places, which is how t easily share the dishes when you have to chop all the bits up evening. I always think they should serve single bites of things, making it easier to share. The prices are good but like all tapas, can add up. But i think if you were popped in downstairs to the bar, for the Spanish tradition of a glass and a small nibble, both the portions and prices work well. 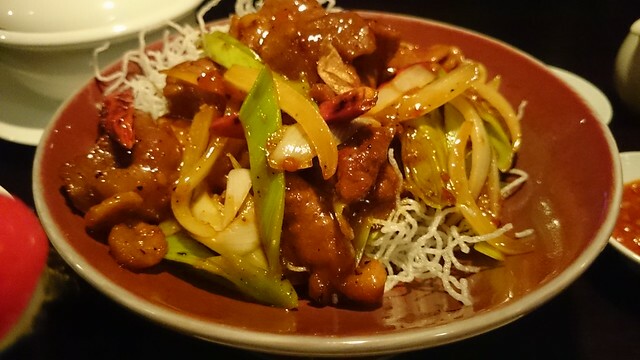 A last minute decision to see what was available led me to an early dinner at Hakkasan Mayfair on Friday night. 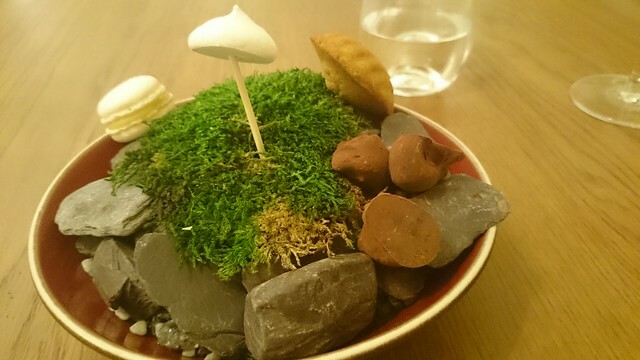 I’ve previously eaten at the Hanway Place venue a few years ago, had a great time with friends with brilliant food and so was looking forward to this. I hadn’t quite realised just how many versions there are of this ‘modern Cantonese’ chain, there are 12 other restaurants around the world but it appears only the 2 London ones have Michelin stars. As an aside, I’d love to be able to add a list onto Opentable so that i could just search to see what had space at the time I was after, would make the booking so much easier! The set menu started with dim sum – a choice of vegetarian or not. A spicy salad – the spice was in the dressing – provided the first chop stick challenge (you need to ask for other cutlery if you want it, it’s not offered). Picking up microgreens takes focus and concentration and if you’re not careful, they go everywhere! A variety of steamed dimsum next (I looked up the names…). 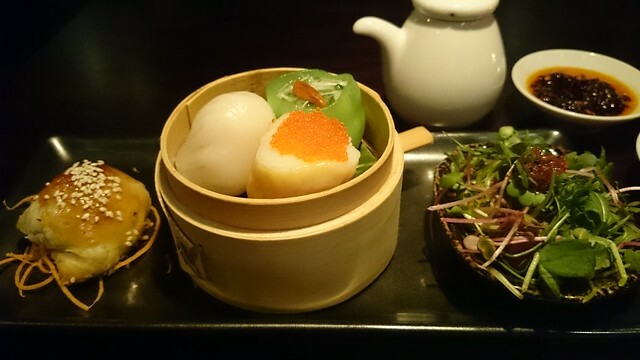 The green crab and chive dumpling, a prawn har gau and a scallop and prawn shumai. This chopstick challenge was about the large size, picking up the whole and eating without dropping. the final element was a venison puff, my favourite, rich, gooey venison in puff pastry type coating. Gorgeous. overall a good starter. I chose the stir-fry Peking style duck with dried chilli, baby leeks and onions. All the mains came with pak choi and Jasmine rice. Of course, i’m wondering what the difference is between Peking duck and Peking style duck. I’m also still wondering if I should have eaten the strange next of dried noodles this dish was served on. I left them, although some of the sauce-soaked ones made their way into eating bowl. A very nice dish, with a good balance of sauce, meat and alliums. The rice was just about the right serving size, not leaving me with the guilt of having to leave some as I’ve had in some places, where you just get a huge bowl. 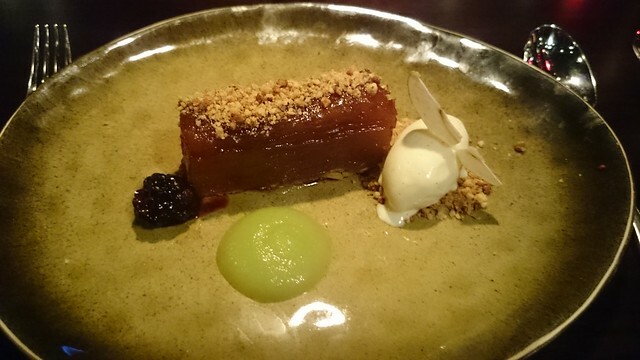 The final dish was Apple Tarte tatin, with blackberry, almond crumble and vanilla icecream. A huge pile of rich apple on a sliver of puff pastry was gorgeous. Loved it. Was my favourite part of the meal, along with the venison puff. And that last sentiment is an indication of what I felt about this meal and the risk of going for set, fixed price menus (that aren’t the tasting menus). You may not get their best, most innovative cooking. 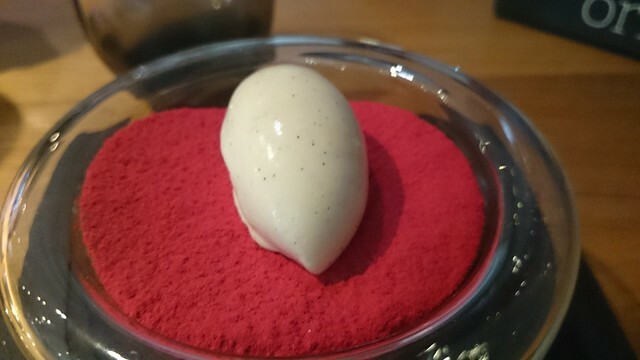 As I said, I’ve been to the Hanway Place version and loved it, the dishes we had were excellent. There was nothing at all wrong with any of the dishes I was served today, the ingredients appeared to be class, the taste was excellent but it didn’t give me anything different. That’s why I’m wanting to work my way through the Michelin starred restaurants, to get great food that leaves me surprised and delighted. This I felt I could have got in any good regular Chinese restaurant. My expectations were too high I think. I would recommend the place but I suggest you go for the more al a carte dishes instead of the regular set menu. 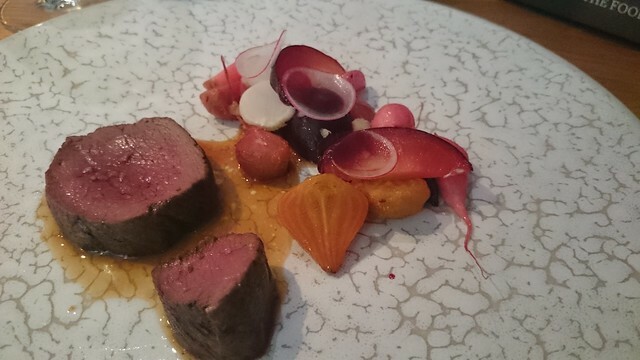 I’m going to visit Hanway Place again and will be doing that, trying one of the tasting menus. Also, although the place was full of couples, it’s definitely not an intimate date place, the lighting is dark and the music was loud. The service too was fairly efficient, with all staff doing their job quickly, with no chat at all, unlike at last week’s Texture. I’m not sure I’m very good foodblogger. I feel I should have a little notebook and quizzing the waiter about exactly what is on the plate and making detailed tasting notes, instead, I often have to read other reviews to work out exactly what all the bits are. I always know the main part, but all the subtleties I can miss. My description range can be lacking too, I tend to grade food as don’t like, OK, like. And I very rarely find things I don’t like and will always finish a dish! The other thing I notice on reading reviews is that I seem to have missed the agreed style, which is saying something about the chef, the restaurant, the decor and scoring things. Unlikely to do that though, you’ll get photos and impressions. The Winter vegetables.. I was surprised that the vegetables were cold but that definitely brought out the flavours. 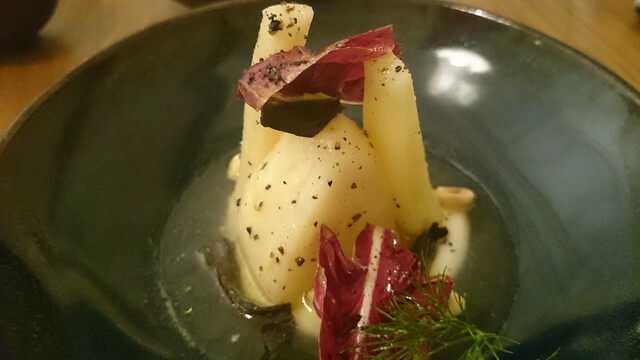 I think there was celeriac and parsnip and one other (see told you I needed to take more notes), combined with a very interesting broth that felt both creamy and fresh at the same time. Could definitely eat a lot more of this! 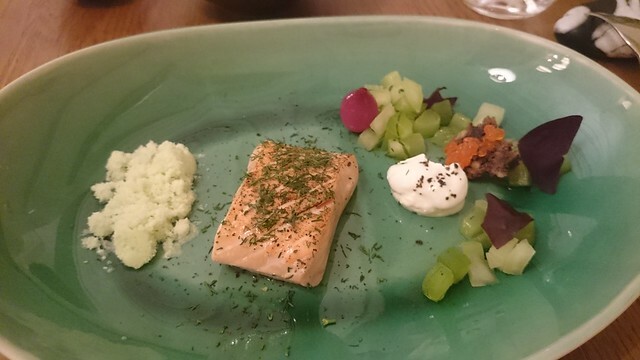 Salmon, cucumber snow, pickled cucumber and apple, creamy sauce, a bit of salmon eggs. Not sure the salmon eggs added much to this dish, but was a tasty bite. The salmon was just on the edge of cooked, which I loved, the edges more solid, the middle softer and just warm. Cucumber and apple complementing with the sharper flavours. And cucumber snow. Lovely! it may be on trend, but I’d love to know how to make it, how it concentrates the essence of cucumber. I could eat a whole bowl of this 🙂 A touch of dill added flavour, as it did in the previous dish. At this point in the meal I did wonder if it would a consistent theme. 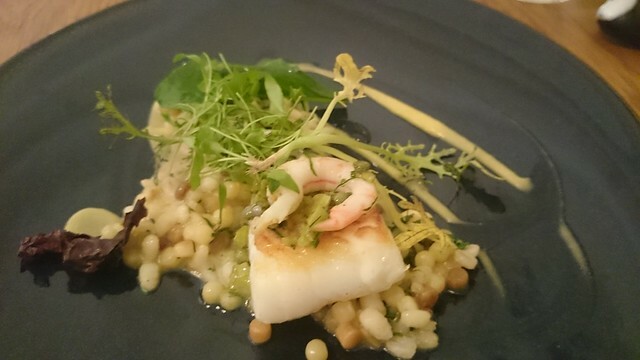 Cod, prawn on a bed of barley, grapefruit and capers. I loved the cod. Unlike the salmon, this was cooked fully throughout with one side really crispy, which provided the texture contrast. Whilst I loved the base, in hindsight, I think it was just about one large spoonful too much (yes, I always eat everything). The capers and grapefruit added punch, but the barley is always more about texture than taste and I could done with a little less I think. The care taken with cooking the two bits of fish in these two courses was obvious, getting two different results and mouth feel. I am slightly confused with this dish. 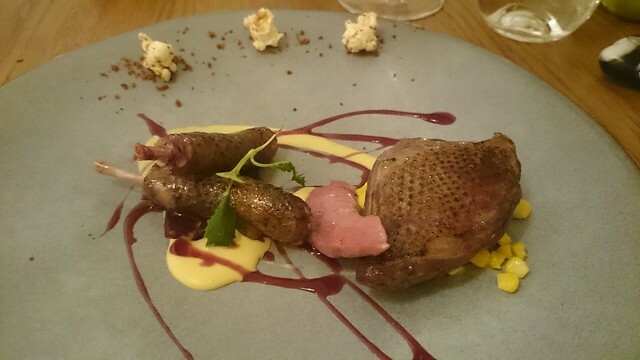 It appears to be listed as Anjou quail in online menus and reviews but I’m sure my menu said pigeon. And it looked and tasted like pigeon! So maybe they had a change and swapped pigeon for quail at this time of year – there are definitely recipes for Anjou pigeon around too. Having seen some of the pictures, I was quite happy that they were serving it without the claw attached to the legs! So breast of pigeon and legs that were formed into sausage type things on a stick. Plus corn 3 ways – cream, sweetcorn kernels and bacon popcorn! I nearly had to embarrass myself when eating this dish as with my little finger in pain, it was a little difficult cutting the meat and I thought I’d have to ask for help! but I managed it in the end. 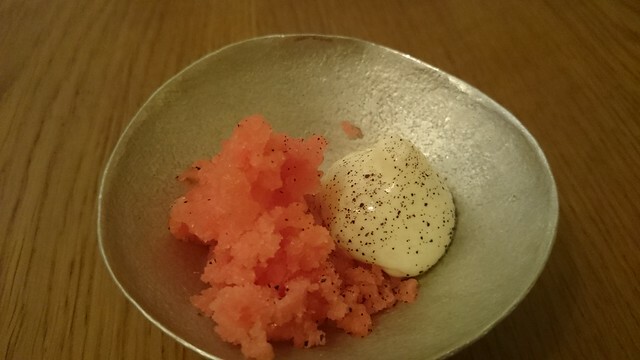 The neat was very tender – cooked sous vide? – but i think the skin could have been a little more crispy adding that flavour too. The dish was finished off with a shallot and red wine sauce. 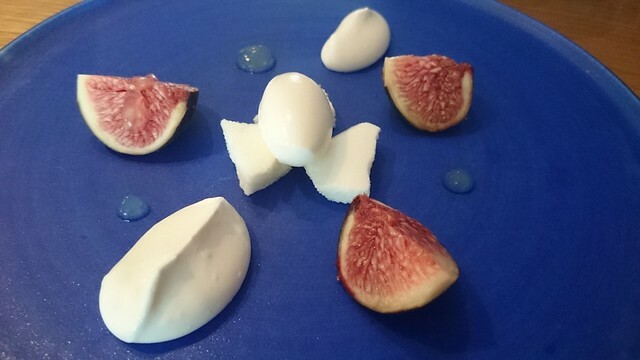 A quick palette cleanser of blood orange ice and sabayon. Then the main dessert (and my notes failed me). 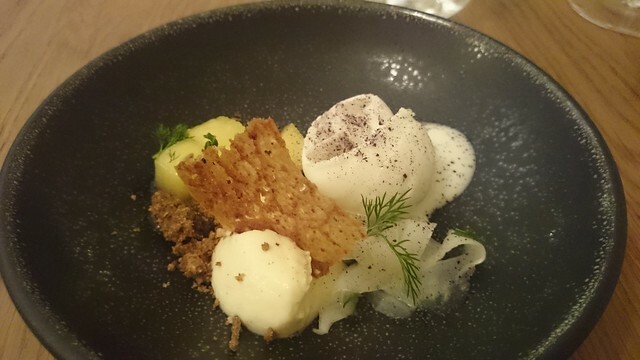 There’s shaved fennel, a crumble mix, an icecream, some fruit. Yes, forgot what was in it. So OK, tasted great but not memorable for me. 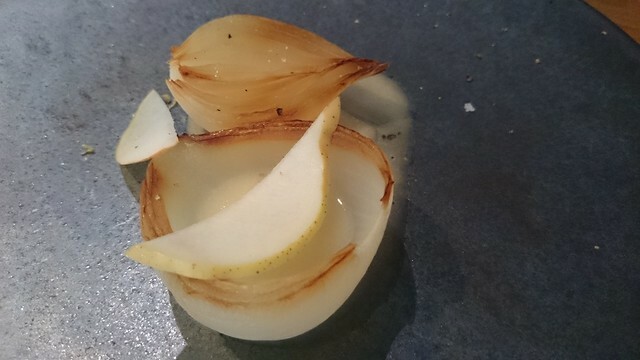 Except for the fennel, that was unusual and balanced everything out well. Finally, sweeties! I love little sweeties like this. I’m not sure, but it tasted like the puff in the middle was flavoured with menthol? Or would that be pine with the northern influence? I’ve read somewhere it was mint. Lovely dining experience overall, some great mini-chats with the team. 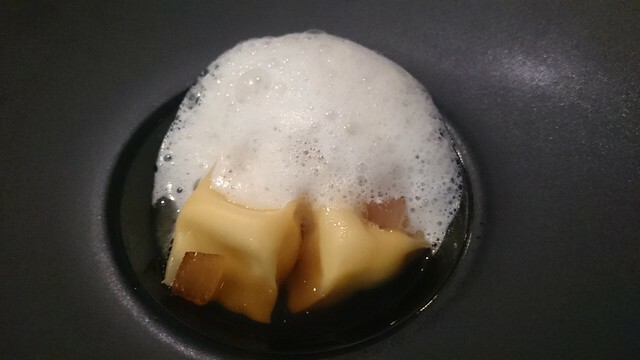 A couple of the dishes were not quite for me, but I could still recognise the excellence in putting them together. So recommended! 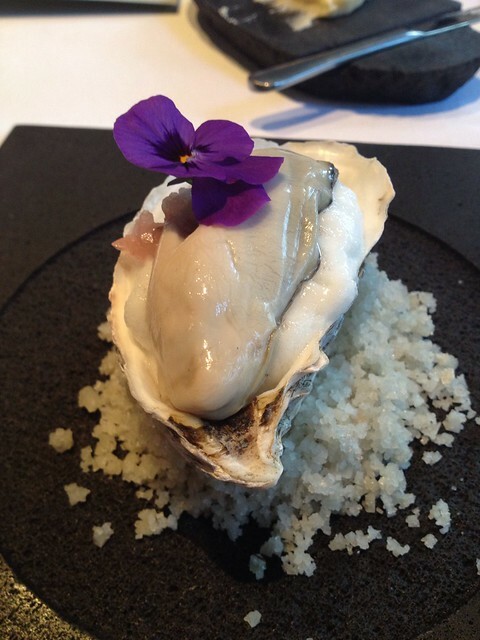 I went for the Lunchtime tasting menu, but the smaller lunch set menu appeared very popular and great value too. One of the Facebook groups I belong to is a running one.There are over 13000 members and people post for all sorts of reasons, to report good races, to get motivation to get out there, for general support. One of the common themes is about losing weight, a common reason for why people want to start running. Whenever the topic comes up, you can guarantee one thing, there’ll be a few people who think the answer is one thing only – eating clean! Now, first of all, they never explain what that means. It most definitely does not mean that you are irradiating everything to remove any possibility of biological contanimation – which it could do 🙂 The most common definition seems to be this (from Fitness Magazine) – “clean eating is about eating whole foods, or “real” foods — those that are un- or minimally processed, refined, and handled, making them as close to their natural form as possible.” But this has become a mantra that is being said without any understanding of the question! One poster this week talked about looking to lose weight and that she needed to belong to Slimmer’s World to help her. Immediately came the call to ‘eat clean’ but a moment perusal of the food suggested would confirm that seems to be a philosophy the company follows. No, it was dismissed as a fad diet and all you needed to do is eat clean. There was no recognition that the peer pressure or support of belonging to a group – even if commercial – provides incentives for people to manage their incentive. The other assumption is that if only one eats clean, then one would lose weight. I can guarantee that if I did nothing but eat fast food I could eat weight – I just have to eat a lot less calories than I’m using. I wouldn’t necessarily be the healthiest, but I’d be losing weight. And the opposite would also happen, I can eat as clean as I like,but if my portions were huge then I’d be putting weight on. It’s not just about the food you eat, it’s about how much. Taking up a exercise will not, on its own, lead to weight loss. Eating clean will not, on its own, lead to weight loss. You need to eat less calories than you use in exercise, and have the right balance of food types to be the healthiest you can be. Luckily, I’ve always loved cooking and creating meals from scratch, so I’ve also tended to ‘eat clean’. But now, I just eat slightly less of it. Another big one of the list. 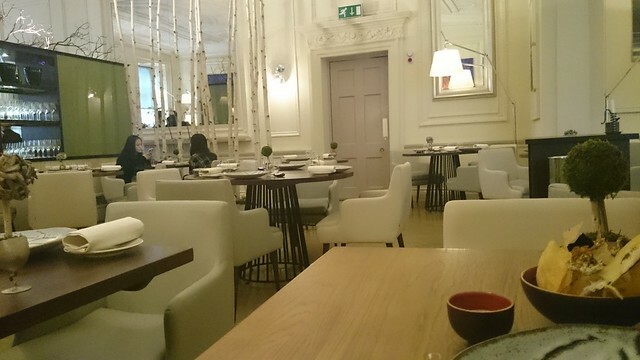 Heston’s Bray restaurant’s are definitely on my list, but let’s start off with a London one. The Dinner restuarant connected to hotel, like quite a few of the top starred restaurants, this hotel being the Oriental Mandarin near Hyde Park. I wonder if the hotel connection means the chef (or his company) has less investment with the hotel taking a higher risk? 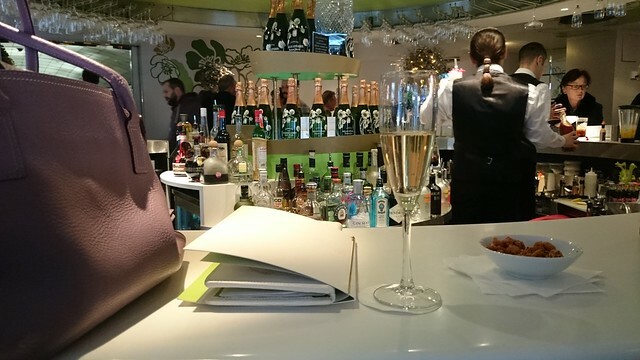 I actually started the experience over the road, at Harvey Nicholls, managing to grab a bar stool for a little glass of house champagne. The plave was full of pre-Christmas shoppers, with shopping bag to person ratio pretty high. In the hotel, I had to ask to find the restaurant, as it’s not well signposted (it’s straight up the 2nd step of steps and then to your left). 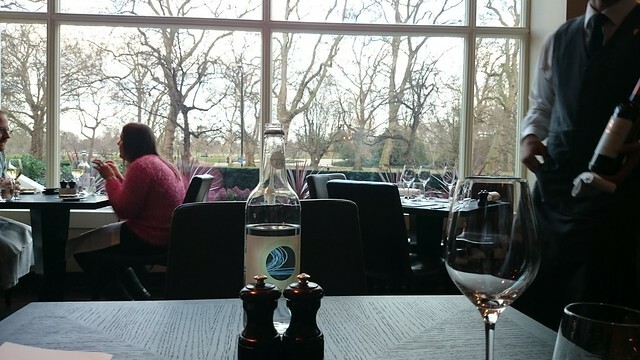 The welcome was good and I was led through to my table with a view of the park or a window into the kitchen. I was given my choice of view, I chose the park. Dinner does not have an ever changing menu, depending on what is available, but has a pretty fixed choice that, looking at reviews, seems to rarely change. I’d spent some time thinking about what I was going to eat and decided that I was just going to go with the top recommended food, the signature dishes for starter and dessert. 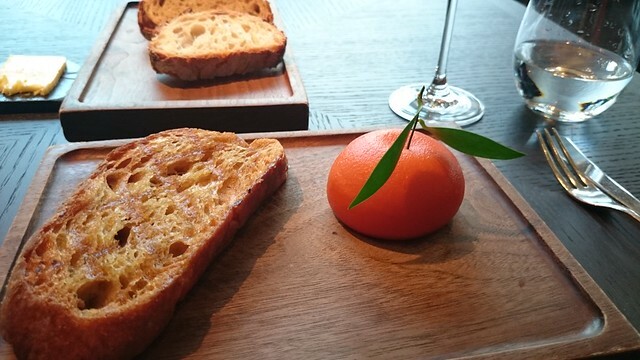 So first up was the Meat Fruit – a liver parfait in a mandarin jelly skin, with toast. I’ve read that they get through so many of these that there is a form of assembly line to prepare them, so there could be a chance that care gets reduced. I have no idea if that was the case, it tasted great. Rich and smooth with the orange providing the citrus cut through. I was disappointed with the bread though. The menu said toast but it seemed to have been fried, there was a fair bit of fat on it. 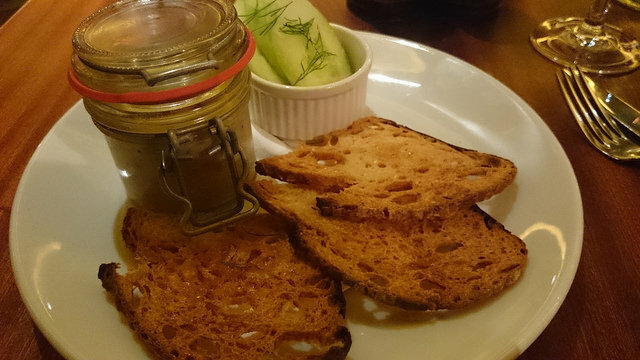 For me, the rich pate with the oily toast was too much, it went far better with the plain bread. 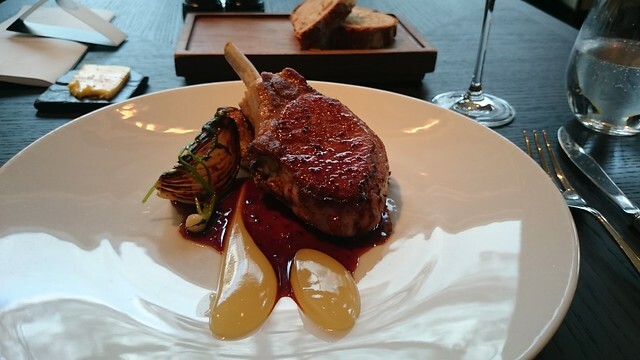 I went for the Iberica Pork chop next, with smoked cabbage, confit onion, apple, mead and Robert Sauce (i had to look this up – onion, butter, wine, pepper and mustard). The pork was cooked perfectly and the sauces were just right for me. I’m happy the sauce was not too mustardy, it’s never one of my favourites, it needs to be subtle (why do pre-made ham sandwiches almost always have mustard on them?). The smoked cabbage was the best surprise, loved it, especially how it worked with the grilled pork, bringing out the charred flavour. Finally, the tipsy cake. Pre-ordered at the start, this was just as everyone else says. 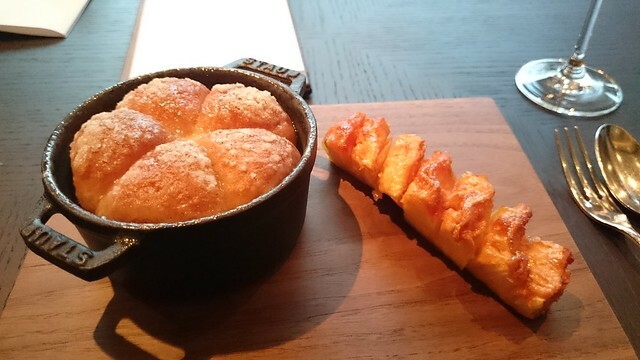 Lovely pineapple and a bready doughy pudding that swam in the creamy sauce. I could have done with another one! 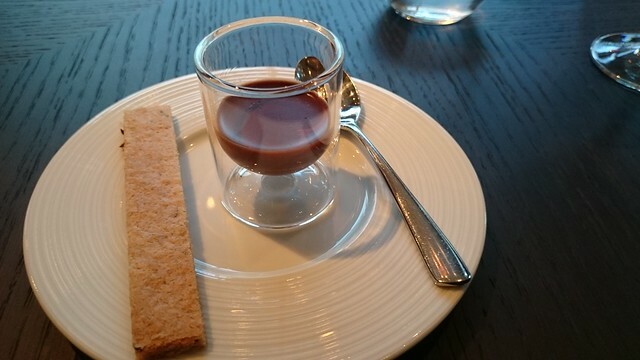 My closed the meal with some port and the ‘free’ course, chocolate ganache (or was it mousse) with a carraway biscuit. I’d been surprised there were no upfront additional courses, but the extra dessert was worth not having that. Service throughout was excellent. I was addressed by name and the guy in charge of the section came by to chat a fair bit, talking about the restaurant, running, other restaurants and a quick guide to sauce making – my view of the kitchen was right in front of the sauce man with about 20 little saucepans all being managed. When I slipped out, via the bathroom, he even chased my out to say goodbye and check if I had enjoyed it! I never felt that my eating alone was unwelcome, which I have had in other places. Excellent experience, not as expensive as I expected, mainly because I only had 2 glasses of wine and I’d recommend for special occasions. At a slight loose end around Covent Garden, I decided to make a quick lunch stop at the Hawksmoor. Definitely one of my favourite steak restaurants, I don’t get there nearly enough. You can go all out and spend a lot of money on steak, but this time I just decided to try out their Express Lunch. 3 Choices of starters and deserts, 5 mains to choose from, it’s a pretty reasonable £24 for 2 courses, £27 for 3. I ended up going with Potted Mackerel followed by the Rib-eye steak. The Mackerel was well presented, served in a little glass pot, but was only accompanied by 3 slices of crispbread, which I found was one slice too few, even thought I’d spread the fish lavishly. Unfortunately, the crispbread was too crisp! It shattered into small bits when you tried to spread on the fish mixture. 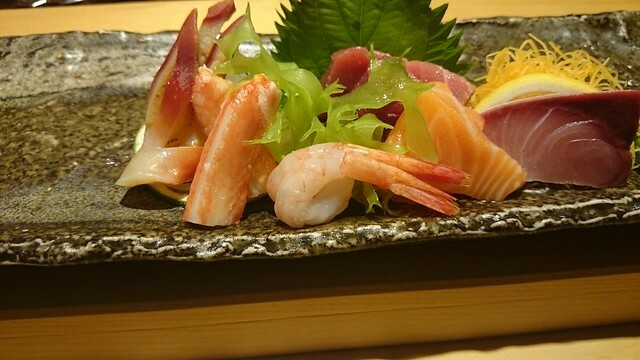 The fish itself was OK, but nothing special. An adequate starter only. The steak was 250g, just the right size for lunch and cooked medium as requested. A lovely piece of meat, served just sitting on the plate. I’d chosen buttered greens to go with it, and they were actually dark green instead of white cabbage I’d been provided at a previous restaurant so very happy with that. 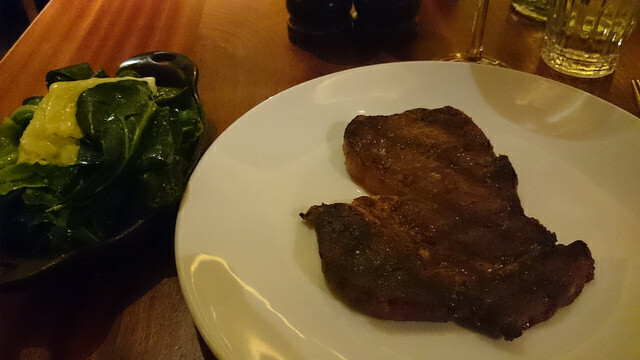 If I had to choose a last meal, steak and greens would be high on my list! I drank some very nice Moulin de Gassac, Syrah/Carignan to go with the steak.